The Nile, the world’s longest river, begins in the heart of Africa and empties into the Mediterranean Sea. Snaking north through eastern Africa for more than 4,000 miles, the river passes through nine countries on its way to the sea. The Nile basin, the area drained by the river’s tributaries, covers 1.2 million square miles. For thousands of years, the Nile River has been the most important geographic feature of this enormous region, providing water and fertile soil for agriculture and serving as a highway for people, goods, and cultures. The portion of the Nile that flows through EGYPT is formed by the blending farther south of three main sources: the White Nile, Blue Nile, and Atbara Rivers. The White Nile, the southernmost source, originates at a spring in BURUNDI. The spring gives rise to the Kagera River, which flows into Lake Victoria, the world’s second largest freshwater lake. Water runs out of the north end of the lake and through northern UGANDA to merge with the outflow from a series of smaller lakes to the west. From there the river plunges over a waterfall and proceeds northward as the White Nile. For 230 miles it wanders through a region called the sudd, a vast swamp in southern SUDAN. At the Sudanese city of Malakal the White Nile absorbs several tributaries flowing from the west and from the highlands of ETHIOPIA to the east. Then it heads north for 600 miles through flat, arid plains to KHARTOUM, the capital of Sudan. At Khartoum the White Nile meets the Blue Nile, which begins at a spring in the Ethiopian highlands. The Blue Nile flows into Lake Tana, dotted with islands on which stand churches, monasteries, and the tombs of Ethiopian emperors. The river runs out of the lake, over a waterfall, and through a winding, mile-deep canyon. Descending onto the plains of Sudan, it flows northward to meet the White Nile. North of Khartoum, the Nile travels through desert. Its only remaining tributary is the Atbara, which rushes down from the Ethiopian highlands during the wet season but is dry from January to June. Beyond the Atbara, the Nile makes a great S-shaped bend before flowing into a reservoir created by Egypt’s Aswan High Dam. Released from the dam, the Nile travels another 700 miles to the sea. North of CAIRO, Egypt’s capital, it separates into two branches, the Damietta and the Rosetta. Together with a network of smaller branches and canals, these river mouths form a fan-shaped delta 100 miles deep and 180 miles wide at the Mediterranean coast. 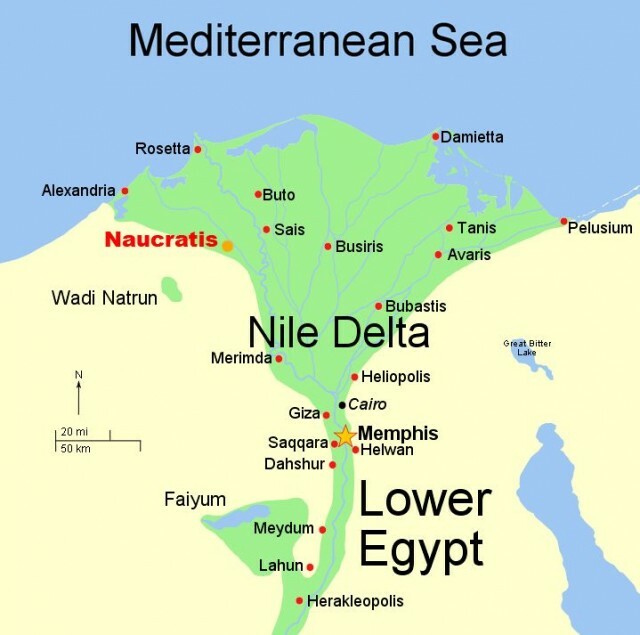 About 60 percent of Egypt’s population lives in the Nile Delta, benefiting from the river’s gifts of water and soil. Since ancient times the Nile has been vital to life in northeastern Africa. Not only does the river provide water in a barren region, but its annual floods, fed by the downpours of the highland rainy season, deposit moist, fertile soil along the riverbanks. The Saharan peoples who settled along those banks soon learned that although the river gave life, it could also be deadly. If the flood was too high it brought destruction, but a low flood could result in crop failure and famine. The Nile nourished the Egyptian civilization that arose 5,000 years ago, as well as the later civilizations of NUBIA in what is now southern Egypt and northern Sudan. After Christianity became established in Egypt, the new religion spread up the Nile to Ethiopia. Then the Arab invasions of the A.D. 600s brought Islam to North Africa, and the new faith slowly moved south along the river. The Nile could serve as a highway, but it had barriers—the swamps of the sudd and the warlike peoples of southern Sudan halted the southward march of Arabs and Islam into eastern Africa. Beginning in the 1800s, Egypt and various European powers competed to control the Nile basin. As part of this effort, European explorers such as Sir Richard BURTON and John Hanning Speke searched for the source of the White Nile. By the end of the 1800s, Britain dominated the Nile from the delta to Lake Victoria. In the mid-1900s however, British colonial rule came to an end, and the African states in the region gained their independence.